A wound may be sealed by sutures or surgical staples. Isn´t the removal of surgical staples very unpleasant? How are surgical staples removed? When do surgical staples need to be removed? 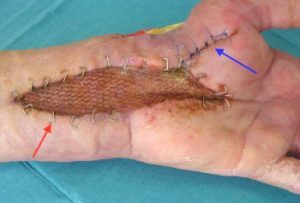 Surgical staples after a split-skin graft. Many patients are very concerned with the removal of stitches or surgical staples! No! Neither the removal of surgical thread nor the removal of surgical staples is very painful! 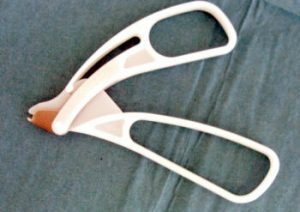 In order to remove surgical staples special tongs are required. With the help of these tongs the surgical staples are held in place and bend. The image above shows how surgical staples are being removed. The tong is constructed in such fashion that it reaches underneath the surgical staple. Squeezing the tong now will cause the surgical staple to bend out of the skin thus allowing for easy removal. 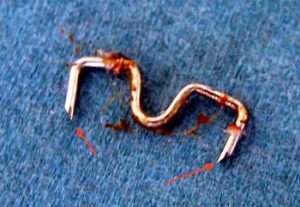 The image shows a removed surgical staple. Bevor the surgical staple was bent with the staple remover tool, the loose ends of the staple were inserted in the skin in a right angle thus allowing the skin to grow together. The removal of surgical staples depends on where they have been applied. Surgical staples to the torso mostly remain in place for approximately ten days. Surgical staples used in hands and feet typically are removed after twelve to fourteen days.